When it comes to evading hungry predators, prey animals have no shortage of tricks — things like like camouflage, prickly defenses — and a hell of a lot of speed. But they’ve also evolved some lesser known strategies as well. Here are some ingenious ways prey animals avoid becoming a delicious meal. Predators tend to get all the hype when it comes to their daily routines. They tend to be seen as highly intelligent, single-minded in purpose, strong, and fearless. As predators ourselves, we’re somewhat sympathetic towards them; we see their efforts as being somehow more nobler than that of the prey animal — creatures with the apparent evolutionary purpose of breeding in quantity to provide a seemingly endless supply of sustenance for those “higher up” in the food chain. This is nonsense, of course. Prey animals are no more or no less nobler than predators. And in fact, given the stakes involved, they’ve had to evolve some remarkable and ingenious countermeasures — adaptations that counter the four primary stages of predation: detection, attack, capture, and consumption. No doubt — the first trick to not getting caught is to not get noticed in the first place. To avoid detection, prey animals have acquired a number of strategies, camouflage being the most effective; blending into the environment makes it much tougher for predators to locate targets. The exact camo a prey animal will use depends on its physiology and behavior. An animal with scales, for example, will develop a different camouflage technique than a furry or feathered animal. They often blend into their environment, which is why polar animals are white, and why forest creatures, like squirrels, tend to have earth tone colors. Animals can also change color depending on the seasons. Specific blending methods include crypsis, which makes animals hard to see — like background matching, countershading, and disruptive coloration — and masquerading, which makes an animal look like an object or another undesirable animal (e.g. stick insects). Of course, predators also like to blend into their surroundings; prey animals don’t have a monopoly on this tactic. What’s more, new research shows that predators can learn to read camouflage. Another way prey animals avoid being noticed is by detecting predators before they detect them, allowing them to either freeze in place or slowly move away. These animals need to be acutely aware of their surroundings. As a result, they have highly evolved senses, including powerful vision, hearing, and smell. In essence, they’re equipped with a highly accurate surveillance system. Predators have similar adaptations, of course. Cats, for example, have evolved incredibly accurate vision that allows them to see in dim lighting. The first thing they teach you in martial arts is that the best way to “win” a fight is to avoid getting into one in the first place. Prey animals know this, which is why many of them practice a kind of conflict avoidance — even after being detected. To do so, they need to signal to an unwelcome suitor that they’re simply not worth the effort. Biologists call these aposematic signals, and they can include such things as warning colors, sounds, or smells. Bright, conspicuous colors often tell predators that the meal they’re about to eat is poisonous, like certain lizards. For some reason, red or yellow, in conjuction with black, has become a commonly understood code in the animal kingdom (which is why many bees have adopted the yellow/black combination). Some animals like to pretend to be undesirable ones, like the wasp-mimicking hoverfly. And then there’s the Eastern Hognose Snake, a bizarre reptile that has developed an entire arsenal of defenses. Dubbed the King of the Bluff, this thing is all bark — and all drama — but no bite. The first thing it does when threatened is strike a cobra-like pose and hiss ominously. Should things get worse, it makes fake striking attacks. If that fails, it starts to play dead by turning its belly up, going limp, and sticking its tongue out of its gaping mouth — a tactic called thanatosis (many predators avoid dead animals, preferring live ones instead). To make its death scene seem all the more real, it emits a musky odor that smells like rotting meat. Technically speaking, the hognose snake is not a prey animal (it eats tiny amphibians), but its survival tactics are fascinating nonetheless. Of course, it’s not always possible for a prey animal to avoid detection, sneak away, or fool the enemy. In those cases where an attack seems imminent, the best thing to do is run like hell. In the cutthroat world of the animal kingdom, there’s no shame in fleeing. And in fact, flight is one of the most crucial countermeasures an animal can take during an attack. This can take the form of running away, flying away, or taking refuge in an environment unsuitable to the predator, like water, up a tree, or in a thick, prickly bush. Inevitably, however, this leads to arms races. One of the most extreme forms of this is the evolutionary relationship between the cheetah and its prey, namely gazelles, deer, and impala. 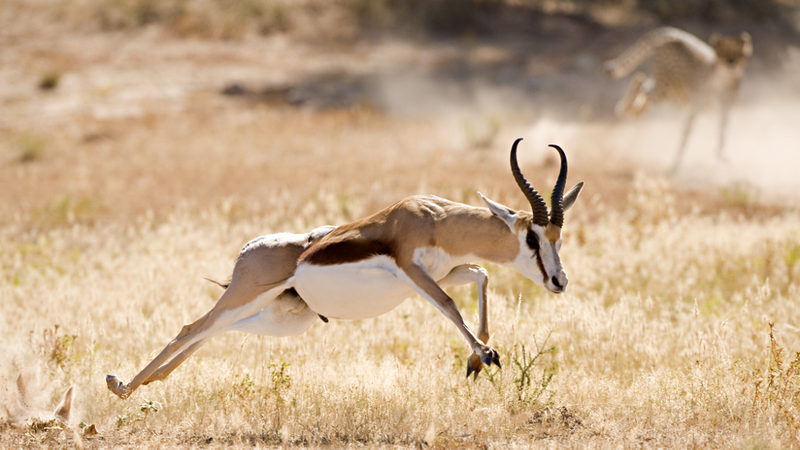 The Thomson's Gazelle, for example, can run upwards of 50 miles per hour (80 km/hr) while using its agile frame to perform quick evasion tactics. Speaking of evasive manoeuvres, some prey animals, like white tailed deer and white tailed jack rabbits, feature flashy white tails that are prominently displayed when they’re being chased down by predators. Zoologists used to think that these tails were used for sexual selection, or as some kind of sign to the predator that it has been spotted (which never really made a whole lot of sense). Rather, it’s a way to confuse predators during a chase. Predators focus on these bright spots during the chase, but at the expense of focusing on the larger animal. When a rabbit or deer executes an evasive manoeuvre — like a sharp turn — the spot disappears for the briefest of moments, giving it some precious added time to escape or prolong the chase such that the predator eventually gives up. Another good evasion tactic are ink clouds spurted by squids and octopi. Other strategies include conspicuous signs of fitness. Gazelles will often jump high with stiff legs, as if to tell a would-be predator that they’re a particularly badass specimen and not worth the effort — particularly if there are weaker, more vulnerable individuals in the vicinity. Prey animals can also fight back by using an assortment of defences, including horns, claws, and teeth. They can also inject venom and toxins to deter attackers. There’s also safety — and strength — in numbers. Some birds practice mobbing, in which large numbers of birds converge on a single enemy. Muskoxen cling together, making it difficult for a predator to single out an individual. Herds, because they work together, employ a kind of crowd-sourcing to detect a threatening predator. And as this dramatic video (above) of a lion attacking a baby water buffalo shows — along with a cameo from a crocodile — prey animals can also stick up for each other. And yes, this video is over eight minutes long, but it’s totally worth it; go ahead and start the action at the 1:55 mark; the water buffalos come to the rescue at the 4:35 mark. If all else fails, prey animals can make themselves rather unpleasant to eat. Things like armour and spines. Some animals can afford to shed a vital body part, like tails or legs (called autotomy). The gecko is a good example. When attacked, sea cucumbers eject parts of their digestive tract. And some prey animals use distraction techniques which direct the predator’s attention away from crucial body parts, like the head or neck. Examples include misdirecting eyespots, and a mother-bird protecting her chicks by feigning a wing injury. Can you spot what&apos;s weird about this picture? There are so many, many more tactics that prey animals can use, and I’m sure I missed many of them. Please add some of your favorites to comments. Top photograph: Bridgena Barnard/Shutterstock; jumping springbok: Johan Swanepoel/Shutterstock.